as I started to get into the Hunter materia myself some weeks ago I was searching for a â€žHow toâ€œ in our forum but could not find any solid informtation, especially not within one topic. This is my try to sum up all needed information on â€žHow to Hunterâ€œ from alot of different sources I used. This is only interesting for you if you are completly new to the hunter materia as that russian guy explained alot of the pros and cons of almost all valiable talents. Ever wondered if Item X is better than Y? And if you should go for a Full or Clipped Rotation? This is the answer! I hope this guide will help you to improve your Hunter skills. Like many other people , I consider Beast Mastery â€“ Marksmanship ( BM-MM ) the best build for leveling. Hereâ€™s the talent layout I recommend for fastest leveling 1-60. Note: I, Buexx, edited the whole text where I saw it is necessary to avoid advertising and wrong information. So , youâ€™ve capped level 60 , youâ€™ve got enough money and youâ€™re ready to venture further. 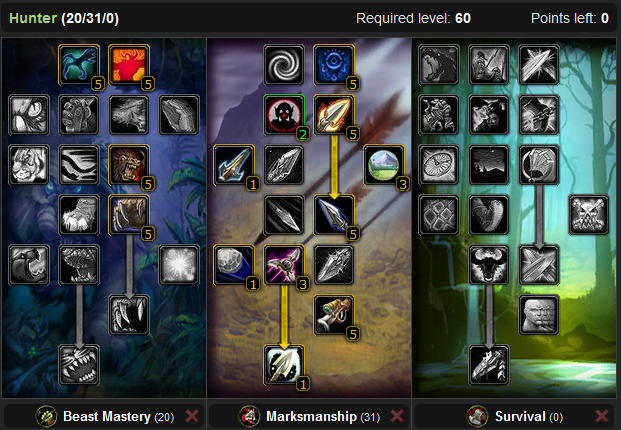 Both BM-MM and deep MM build are suitable for visiting pre-raid instances. However , I strongly recommend to collect your pre-raid set in deep MM build. A naked MM hunter will partially lose damage compared to BM-MM if we take pet into account , but it will be much easier to find a party. Hunter is not the most desirable class in these dungeons and an average party can go on without him. MM hunter has several pros , such as Trueshot Aura and Scatter Shot. He also possesses deterrence , raptor strike crits , improved traps , more stamina etc due to talents in Survival. BM hunter has more total damage and an additional control â€œitemâ€� â€“ a powerful pet able to tank. Unfortunately , BM hunter is not highly demanded in these dungeons. If you receive invite for the last slot in the party , you may be asked to dismiss pet and turn on Trueshot Aura. If you do neither 1st nor 2nd , youâ€™ll be looked at quite obliquely or even kicked from the party. If youâ€™re ready for that â€“ youâ€™re welcome to choose BM-MM , else MM is your choice. I understand that pet phobia is not born from scratch. But in my opinion , the point is not in the pet but in the man right in front of the screen. Some can perfectly control their pets , while others wipe raids even without them. I personally didnâ€™t pass a day in BM-MM specc at lvl 60 , but I got invited in MC right after capping and thereâ€™s no place in MC for a naked BM hunter. However this (prior to 1.12 written) guide on TKA something compares Survival with MM and comes to the result that even with 467Agi Survival is not worth speccing into it. In a 3min fight we would (3s Attackspeed) shoot 60 Auto Shots, 30 Aimed Shots and 15 Multi-Shots (you only use Multi-Shot every 5 of 6 Rotations, see Chapter about Rotation/Cycle) if we go Full Rotation. The point of no return for Survival spec for maximized single target damage without a pet should be arround 500Agility, however if you can use a Pet you should prefer the BM/MM spec (the group support of Trueshot isn't even counted in). A large part of this chapter will be dedicated to MC , the dungeon youâ€™ll spend most of your time in. 1 ) Order your pet to attack the target mob. 2 ) Hunterâ€™s Mark on mob. 4 ) Autoshot till the mob dies. All this will allow you to always have full health and almost full mana in case of occasional PvP.. The best mobs to kill are -1-2 levels to yours , those give much experience and possess little threat. Some may say that â€œwell , I can kill a mob +5 levels of mine , or an elite of my lvlâ€�. You certainly can , but after the fight youâ€™ll have zero mana , a barely alive pet and half health. During that fight time , you could kill 2-3 mobs of -1-2 level and get more experience , loot , money without an unnecessary risk. Iâ€™d advise to grind humanoids and undead cause they drop very much Cloth ( Linen , Wool , Silk etc ) , which stacks by 20 and costs much at AH. So youâ€™ll return to city less to sell all the crap youâ€™ve gathered during grind. Questingâ€™s good too , but if you wish to level up quickly , you better know where to go and what to do in all quests you take. Otherwise , it may take more time than simple grinding. Another option is levelling up in dungeons. A good one , youâ€™ll almost always have very good blue items on your character , but thereâ€™s one â€œbutâ€�. You need a party in which youâ€™re 100% sure. No constant AFKs , no wipes and so on. Believe me , itâ€™s very hard to find such a party (especially on VanillaGaming with the 15x rates we got) , but if you did â€“ hold on to them with both hands. 1 ) Put a freezing trap right in front of the healer , if he gets aggro , which happens if 2-3 mobs are tanked simulatenously , one of the mobs will be trapped and your party will have extra 10-26 seconds. 2 ) Always keep an eye on the healer ! Itâ€™s your second to damage dealing party role. If a healer gets attacked by 2 mobs â€“ one should be trapped , use pet to tank another ( using intimidation on such a mob will almost surely make him attack your pet after the intimidation stun is over ). If a healer deals with more mobs attacking him â€“ try using distract shot or multishot to get aggro. Anyway , those mobs better attack you than the healer. You wear mail ( leather before level 40 ) and you have much dodge. Priests have neither 1st not 2nd. More than that , any healing class will have problems with healing if attacked by multiple mobs. So by pulling mobs off the healer youâ€™ll ease his task â€“ heâ€™ll be able to heal tank , your pet and you. 3 ) Basically â€“ let the tank gain arrgo. A mob should be attacked only after 3-4 seconds after pull and begin not with an Aimed Shot ( I wouldnâ€™t recommend using it anywhere except PvP and raid dungeons ) , but with a Serpent Sting and then spam Arcane Shot. 4 ) Donâ€™t use multishot. Itâ€™s a good ability , but thereâ€™re no low level tanks able to firmly hold 2-3 mobs at the same time. A multishot will likely make 2 of 3 mobs attack you â€“ so use it only after mobs have 50% health or less. Also be sure , that your multishot donâ€™t break any crowd control ( sheep , sap , shackle etc ) â€“ your party wonâ€™t donate you cookies for such a thing. 5 ) Use mark before the pull and later to ease concentrating all party damage on one mob ( Note : this was written before 1.11 patch introducing well-known raid targeting system ) This will lower the possibility of somebody stealing aggro and receive minimal damage income. After killing the first mob , mark the one attacked by tank ( assist button is F by default ). If your party uses crowd control â€“ choosing the next mob to kill is up to you. The common order is : trapped mob â€“ sapped mob â€“ shacked/sleeped mob â€“ sheeped mob. 6 ) Kill casters first ! They usually deal most damage , often AoE , so they have to be neutralized quickly. Commonly this means a sheep or sap , if both donâ€™t occur â€“ kill em right after the pull. 7 ) If you have to pull a caster or a mob with ranged attacks â€“ either break his LoS ( Line of Sight ) or run out of his spellsâ€™ range. These actions will make the mob follow you by feet. 8 ) If you see a mob ( humanoid ) trying to run ( they usually do this at 10-30% health to call for help ) , try stopping him with scatter shot â€“ concussive shot or intimidation. All rules written above are right for all 5-men dungeons. 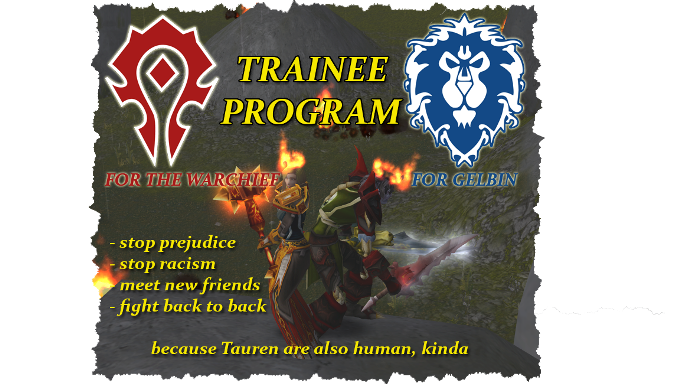 In UBRS or ZG ( where there are many people ) youâ€™ll have to arrange with other hunters about who marks mobs and who looks after which healer. 1 ) At UBRS General Drakissath is sometimes killed with use of pull-away tactics. A hunter activates AoC , pulls him using Distracting Shot , runs to the arena or to a cave where originally â€œThe Beastâ€� boss stands and then uses Feign Death. During that time , the party kills both adds and waits for the boss to return. The only trickly moment is the low speed of the boss , which may lead to him evading and returning to the party earlier than planned. So one should use Arcane Shot or stings to avoid such a problem. 2 ) At Dire Maul recommended tactics for King Gordok is tanking Choâ€™rush using a pet , far away from the king himself. A hunter stands at maximum range from the king , right between the king and the pet. So youâ€™re able to shoot , youâ€™re able to heal your pet if necessary and Choâ€™rush canâ€™t heal the boss. Great ! 3 ) At Maraudon and ZG , an aspect for 60 Nature Resistance will serve you well. 4 ) Some instances contain stealthed packs and patrols ( for example , Eyes of Naxxramas in Strat , Eldreth Spectres in DM , Blackrock Assasins in UBRS ). Some of these can cause serious problems , but a hunter can prevent that. If you know a rough position of a mob â€“ you can break his stealth with a flare , this wonâ€™t engage the mob (it does on VanillaGaming, so watch out!) but your party will know what awaits them. While youâ€™re geared in blues , you wonâ€™t deal damage even close to roguesâ€™ , deal with it. Youâ€™ll recoup only after you obtain full T1 and the epic quest bow. With good neck , rings , trinkets etc , youâ€™ll be practically equal to rogues. When you get a Chroma Crossbow , youâ€™ll both leave rogues behind and face a new problem : mages. The only moment when a hunter can steal aggro is the beginning of the fight , if Feign Death resists once or even twice. Keep an eye on that !!! If your first Feign Death at the encounter is resisted , better only autoattack the boss till the next Feign Death. In case of double resist , stop damaging at all till next Feign Death. Never start attacking a mob who has less than 2 Sunder Armor effects ( 5 for bosses ). Start attacking step by step , use Serpent Sting , Multishot and only then Aimed Shot ( Note : Better donâ€™t use sting even if thereâ€™re free debuff slots. Hunters have constant problems with mana and Serpent Sting has very low dpm ( damage per mana ) parameter. If you see that you donâ€™t have enough mana to deal maximum damage for the whole fight â€“ conserve mana for Aimed Shots. Serpent Sting is the first thing to sacrifice. And yes â€“ debuff slots are limited , with SS being a useless debuff compared to CoE , CoS , SA etc ). Watch out for critical hits â€“ if you had several in the very beginning , donâ€™t wait till the mob attacks you and perform Feign Death a bit earlier. Keep Feign Death on cooldown till the boss has 50% health. If tanks didnâ€™t die or change during that time â€“ you may stop permorming Feign Death for the rest of encounter. Also , mobs often stand in pairs , in this case donâ€™t damage the first mob too much and make full burst for the second ( including trinkets , Rapid Fire etc ). While you kill the first mob , the second tank will gain very much arrgo. To increase your damage , try to stand at a position , from which your Multishot hits maximum targets. But remember , if one mob is close to you , and another is far away , this wonâ€™t work. So keep similar distance to all the mobs. You can also try holding a sting on every mob , this will add to your damage too. Always keep a mark on the mob youâ€™re attacking , thatâ€™s free 110 AP. Attack mobs with SA debuffs on them. Firstly , thisâ€™s evidence that a mob is being tanked. Secondly , 5 stacks of SA reduce oneâ€™s armor for 2250 and you get increased damage. The priority targets for you are casters , let the mages deal with melees , their damage doesnâ€™t depend on a mobâ€™s armor. Also try asking druids to apply FF ( thatâ€™s -505 armor ) and warlocks to apply CoR ( additional -640 armor ). ( Note : CoR increases a mobâ€™s AP. Donâ€™t ask for it on tough melee mobs. At Valkyrie-wow , FF and CoR didnâ€™t stack a long time ago , this seems to be fixed , but still check out. A certain bug is : normal FF and feral FF stack ). So , weâ€™ll have a total armor reduction of 3395 , this increases your DPS by 20-40% depending on the mobâ€™s armor. The main skill needed for dpsing as a hunter is using Aimed Shot correctly!!! Let me explain, what I mean. I donâ€™t know whether itâ€™s a bug or a feature, but atm Autoshot is always â€œon cooldownâ€� during the Aimed Shot cast. You can easily check it by spamming Aimed Shot â€“ youâ€™ll always see an Autoshot performed right after the Aimed Shot cast has finished. Use it wisely â€“ try casting Aimed Shot in a window between white attacks! Of course, if you have a fast weapon â€“ itâ€™s only partially possible, because Aimed Shot has a whole 3 seconds cast time. But it will still give you a DPS increase, because if you donâ€™t watch your white attacks, you can, for example, occasionally start Aimed Shot cast 2 seconds after Autoshot. So, next Autoshot will be cast only 5 seconds later (these 2 seconds + 3 second Aimed Shot cast) and youâ€™ll partially lose Autoshot damage. The rule is â€“ WATCH your Autoshots and cast Aimed Shot right after Autoshot is launched. At the beginning, this will be quite hard and you will do nothing but watch your cycles. But in course of time youâ€™ll gain experience and be able to intuitively determine when to start Aimed Shot cast. Keep in mind that Autoshot animation takes some time and thatâ€™s a problem: an Autoshot itself is considered casted, but the arrow and especially the damage numbers upon the mob appear a bit later. Believe me, loss of this time is no use for you and due to that time (and, of course, ping) youâ€™ll become a good hunter of regular and the best of good. For me the signal to start Aimed Shot cast is a sound of sinew being pulled. This is not universal, because many people play with music in their headphones and disabled game sounds. If you do so, you have to find some other sign. So the cycle consists of the following: Aimed, Auto, Multi, Auto, and Auto. This cycle allows to not losing Autoshot damage while casting Aimed Shot. This ideal, however, is broken by Multishot, because its cooldown is 10 seconds and cycle length is 9 seconds. In the 2nd cycle, Multishot will be cast at 4th second instead of 3rd and so on. Eventually, Aimed Shot and Multishot cooldowns will finish simultaneously. In this case, Aimed Shot should be cast, because using it will shift Multishot cooldown by 3 seconds, while Multishot cast will shift Autoshot and Aimed Shot cooldowns by 1 second which will lead to problems in the next cycle. Roughly, Multishot will be used only in 5 of 6 cycles. Take the fastest of these weapons with 3.1 attack speed. Total length cycle is 8.4 seconds, while Aimed Shots are cast every 9 seconds. So one has to go AFK for 0.6 seconds, but remember â€“ itâ€™s impossible to start Aimed Shot cast right after Autoshot. The length of this â€œwindowâ€� depends on ping, lags, reaction, mood and God knows what else. If you lose 0.6 seconds in the â€œwindowâ€�, this cycle will be ideal for you. So , the more experience you have , the faster your connect is , the higher skill you possess â€“ the less time you need to start Aimed Shot cast and the slower weapon is ideal for you. Also, donâ€™t get sucked into different cycle lengths â€“ the common thing for these cycles is 9 seconds from one Aimed Shot to another. Autoshot damage loss and Multi-Aimed cycles (Also referd to as "Clipped" Cycle). Only 3.45 attack speed allows casting Aimed Shots without damage loss. In any other case, casting Aimed shots will reduce the number of Autoshots fired per hour. The main point of all this â€œcycle theoryâ€� is to fire as many Aimed Shots as possible without a significant loss of Autoshots! 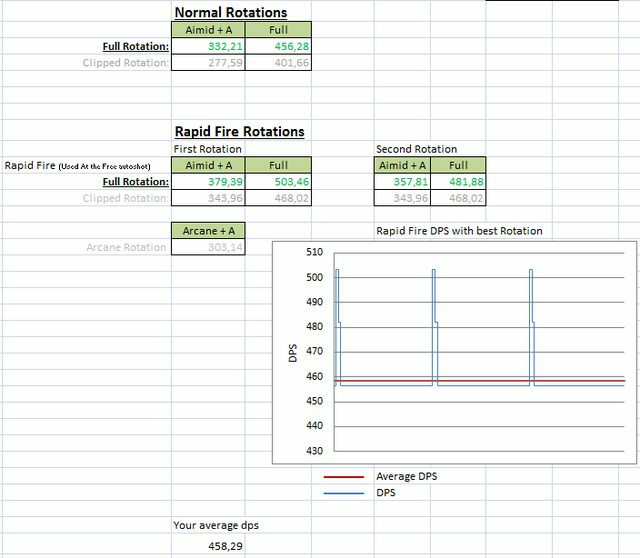 DPS for different cycles may be further computed more accurately, because different abilities cause different damage with different gear and without any additional knowledge itâ€™s hard to say whether 5 Aimed Shots are better than 11 Autoshots. As you can see, these cycles are a bit longer than 10 seconds and they contain 4 Autoshots instead of 3. They are called Multi-Aimed cycles and used for fast weapons. The main advantage of these cycles is that both Aimed Shot and Multishot cooldowns are shorter that the cycle length, so one may DPS forever after surfâ€™s up. Another advantage is mana regeneration. Both abilities are fired simultaneously and then no abilities used for 10 seconds, thatâ€™s 2 ticks of mana regeneration. The problem is the reduced number of Aimed Shots, whichâ€™s compensated by increased Autoshots number. For the experienced hunter this will be known stuff, if you are one of them and want to go way deeper into the materia I can forward you to Lactoses post in the elitist jerks forum. As it fills 6 posts within there I will not copy it here, but it is worth reading all of them if you want to maximize your Dps. Click on the banner below for the topic. To determine the effects of various, passive and activated/cooldown, trinkets available up to Naxxaramus combined with the hunters ability to Feign Death and swap trinkets in the middle of a fight. A fully raid buffed, reasonable well geared hunter with range against a zero armor target, with no aggro or mana issues, using Rank 5 Multishot and Rank 6 Aimed shot with a 3.0 speed (after quiver bonus) crossbow, 13.5 DPS ammo, in a 10 second shot rotation. I'll be using the Xbow of Smiting average damage for the calculations. Rapid fire will not be calculated into the damage results, as it is a multiplier of your current average DPS, thus whichever trinkets increases your average DPS the most will benefit the most out of Rapid fire. Damage is calculated per 10 seconds, assuming 1 Aimed Shot, 1 Multishot, and 3 Auto Shots take place during the 10 second rotation. There is several schools of thought on actived trinkets such as Devilsaur Eye and Earthstrike, one is to open with the trinket, Feign Death and swap to a passive trinket, Feigning Death again 30seconds from the expiration of the trinkets cooldown in order to minimize the time spent without a stat boosting passive trinket. Another is to juggle several activated trinkets, in the hopes that the damage done during the time the trinkets are active will out damage the 30 seconds worth of no stats during the trinket swap cooldown. 1) Starting with an activated trinket and a passive trinket, opening with the activated trinket, FD and swapping to a passive trinket for the duration of the cycle, without ever swapping back. 2) Starting the same with the above combo, however, 30 seconds out from the expiration of the cooldown, FD and swap to the activated trinket for another burst when the cooldown/equip cooldown is finished. 3) Starting with one activated trinket and a passive trinket, opening with the activated trinket, FD and swapping to another activated trinket at the 30 second mark, activating the second one at 60 seconds, and swapping to the first activated trinket again at the 90 second mark. 4) Starting with two activated trinkets, opening with the first one, activating the second trinket, FD and swapping in two passive trinkets. 5) Same as the above, however at the 90 second mark FD and swap in the two activated trinket to continue the cycle. For the passive trinket, the priority will be Blackhands Breadth, followed by the Drakefang Talisman. For the activated trinket, the priority will be Earthstrike and then the Devilsaur Eye. Earthstrike with Blackhands Breadth, FD @ 20 seconds and swapping to Drake Fang Talisman. Earthstrike with Blackhands Breadth, FD @ 20 seconds and swapping to Drake Fang Talisman, FD @ 90 seconds to swap in Earthstrike. Earthstrike and Blackhands Breadth equipped, FD and swapping to Devilsaur Eye at 30 seconds, using the Devilsaur Eye at 60 seconds, FD and swapping Earthstrike for Devilsaur Eye at 90 seconds (This ones very messy, IÃƒÂ¢Ã¢â€šÂ¬Ã¢â€žÂ¢m open to a better way of sorting multiple activated trinkets, and be happy to model it). Note: There is just too much dead time of not having a +AP buff during this rotation. Earthstrike and Devilsaur Eye equipped, activating Earthstrike followed by Devilsaur Eye, FD and swapping in Blackhands Breadth and Drake Fang Talisman. Earthstrike and Devilsaur Eye equipped, activating Earthstrike followed by Devilsaur Eye, FD and swapping in Blackhands Breadth and Drake Fang Talisman, FD and swapping n Earthstrike and Devilsaur Eye at 90 seconds. According to my calculations, In order to have an overall higher DPS, in a sustained fight, than a Blackhands Breadth + Drake Fang Talisman combination, the simplest solution that requires the least amount of Feign Deaths is keeping Blackhands Breadth active, and cycling Earthstrike with the Drake Fang Talisman. This does not take into account the times that you would be otherwise unable to DPS. Maximizing the time DPSing while the trinket is activated, and keeping as much of the cooldown time during a time that you would be otherwise unable to DPS will maximize the use of such activated trinkets. Given my lack of experience with endgame content, I cannot point to a specific fight and say which times that would be. In addition, given the knowledge that FD+Drink is less than optimal for DPS, I wonder how much more benefit that a FD+Drinking rotation would get out of using the trinket swap cooldown during the drinking time. I' ll be attempting to model this soon. I apologise for the lack of formatting -_-. Thoughts? And remember, Feign Death not only lets you change your Trinkets, you can switch arround your whole gear. You could think about wearing 2/9 T3 for more duration on Rapid Fire and 5/5 T2.5 to lower its cooldown by 2 minutes. After your first Rapid Fire you could switch back to your 8/8 T2 to apply the Expose Weakness effect again. When you use Feign Death to switch arround gear, make sure to have no Serpent Sting on the target, no arrows flying and your Pet not attacking. Otherwise you will be in combat again very soon and it won't switch your gear. Addons that help you doing this can be found in Chapter 7 â€“ Macros / Addons . This excel sheet designed by our tester Janitor is a tool to check possible upgrades aswell as decide if you should go for a Full or Clipped Rotation. x Auto Shot, depending on weapon speed and cycle lenght. Aimed Shot finishes cooldown. Auto Shot fired ~1 sec ago. Should you clip your cycle (ignore the next Auto Shot and fire Aimed Shot immediately)? Or should you use a full cycle (wait for the Auto Shot before using Aimed Shot? What would give the highest damage potential? To answer this, you needed to compare both options, and see which one would yield the most damage. The red area is where you update the gear/enchants to yours or the items that are an possible upgrade. The light blue area shows you the stats of the items you inserted. When you scroll down a bit you will see an option to adjust your race (or try how awesome your DPS would be if you would have picked the right one), a summary of your total stats aswell as, like in my case due to missing enchants, the red message that you lack +Hit. NOTE: The DPS sheet within the current state lacks the option to enchant your ranged weapon. IF you have the +3% Hit Scope in it you have to either adjust the weapon stats or accept the red field with the "NOT CAPED" message below it. Janitor explained that Hit cap is not part of the calculation as you should always be hit capped (and if it is only to not miss a Tranq Shot!). Therefore if you use a +3% Hit Scope you accept the red field, aslong as it says "6". The calculation is still the same. Further down you will be able to see your current Stats on the right hand side, aswell as the stats of your weapon. Adjust the Quiver/Ammo Bag speed increase and insert the DPS of the arrows/bullets you use. This can be quite interesting to see how much farming the blue arrows/bullets from dungeons would do on your DPS. You can also adjust the Target, what Rank of Improved Hunter's Mark is used and how long the fight takes (as you can see only for RF calculation at the moment). Below those settings you have an overview of your Average and Crit damage of several abilities. We will in most cases only use the top three of those, but it is always nice to know how much a Arcane Shot would hit for, in case we need to kite/move. At the bottom of the sheet you can finally see if you should go for a Clipped or a Full Rotation and what the difference in DPS would be between them. You can also see the DPS-Peaks with Rapid Fire in a chart on the right. barring these upgrades and adding the T3/naxx items I think the Sheet is complete. HF with it. 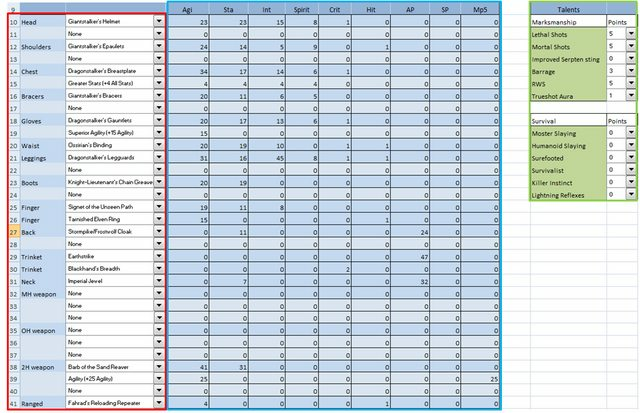 As you might see the sheet is not perfect, but especially for players who are rather new to the hunter materia it helps alot to check possible items, if they are worth your DKP or not. This is a somewhat complexe Chapter, as Pets on VanillaGaming are not working exactly like on retail. At the moment (27.12.2014) Pets scale with your stats, meaning they are, especially with high end gear, stronger than they are supposed to be. If some high geared Hunter wants to provide me with an screenshot of what his full buffed Pet does DPS wise at the moment I would be thankfull and show it here, just to point out how crazy overpowered our Pets are at the moment. As the places where to find special pets are correct aswell as the different species I would like to forward you here to the awesome "TKA Something" website. By clicking the links below you can see where to tame your favourite pets. Click on the banner to visit their summary of Pet abilities. As stated in the first post not everything is completly blizzlike in terms of hunter pets on VanillaGaming. - Scatter Shot Macro to make your Pet not break the disorient. - Freezing Trap Macro that uses Feign Death only if you are in Combat and stops your Pets attack. If you want your pet to stay where it is and not run back to you simply switch the "PetFollow" to "PetWait"
- Frost Trap Macro that uses Feign Death only if you are in combat and places the Frost Trap. - Mongoose / Raptor Strike within one Button. Will use Mongoose Strike if its activated, if not it will use Raptor Strike. Can also be extended to use Wing Clip if Mongoose and Raptor Strike are not ready. - Calls your Pet if it is gone, Dismisses your Pet if it is there. - Sends your Pet to attack your target, or, if your target is friendly, his/her target. If your Pet is already attacking it will run back to your side. And there is many more of those at TKA Something, check their website out. Didn't read through this but it seems overly complex for a class whose only practical use in PvE is kiting, tranq shotting and placing traps xD. Yes, if you are a baddie. 830 dps on Patchwerk. We can if we want ! Did you maybe record it? Shortened the Build Chapter and updated it with an really interesting outcome for a 20/31/0 vs a 0/21/30 (Scroll to the bottom of the post). The DPS calculated there are against a 0 Armor target, Mongoose Potion, Aspect of the Hawk RAP and, depending on the build, Trueshot Aura. The gear I used can be posted if you want me to, but think about close to BiS gear. I count with a perfectly performed Full Rotation what probably not alot can achieve over a three minute fight.